I hope that you have had as much fun as me with the Giveaways each day! They were super fun and it’s something I hope I can do again!! Today, my final day of Giveaways is devoted to my photography business. I had no idea that 8 years ago when I got my first DSLR that it would turn into such a fun and challenging business. But now, 4 years into having a Studio, I couldn’t be happier! Thank you all so much for your unwavering support! I couldn’t do this without you! 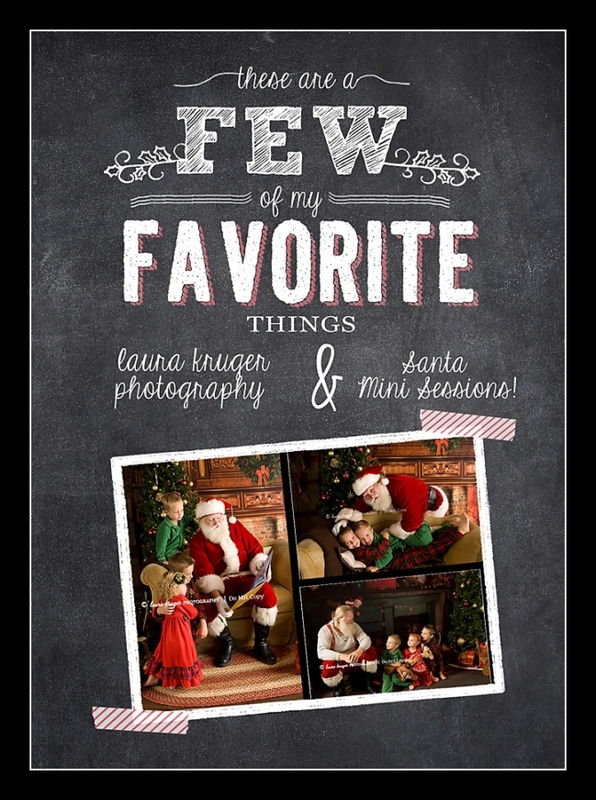 My very favorite session of the year are my Santa Mini Sessions!! The main reason why I started doing the Santa Mini Sessions was for my own children. I wanted to create timeless images for them with Santa when the magic is palpable. I get to let them spend extra time with him, hangout, take lots of fun, different, and unique pictures. My kids think it’s amazing. Since my Mini Sessions only last 10 minutes for other families, I want to extend a Special Santa Session to one family next year. You will get to come to the Studio in September and have an experience with Santa like no other. This year I did the regular Santa Sessions and the Magical Workshop Sessions. Next year, in 2015 I have something HUGE up my sleeve. I promise you won’t want to miss out on it! You will be my model family for the event. (Yes, you read that right…EVENT!!) It’s huge! Your family will be used in all of my marketing and promotional material for the event! You will get the entire session and images GIFTED to you!!! The Contest will run until Sunday night at 10pm. Good luck and continue to Enter each day until then! !